Shivananda Pukhrem, Author at Solar Love! One of the most important parts in PV system architecture is the power converters. The reason is that they play an important role in transforming the different types of electricity, to make the electricity convenient to the end users. Since the solar cell produces a DC type of electricity, there’s room for various types of power converters. Here, some of the most commonly used power converter types are briefly describe according to their topology, function, efficiency, and the major global manufacturers. 1. Power optimizer: Commonly known as a DC-DC power optimizer in solar PV markets, a power optimizer is a module-level power converter. It takes DC input from the solar module and gives either higher or lower DC output voltage. Such a converter is equipped with an MPPT technology to optimize the power conversion from the solar panel to the DC load or a battery or central inverter. It is also considered one of the most efficient power converters, delivering up to 99.5% efficiency. However, it needs DC cabling from the array. Some of the major players in this power converter market are SolarEdge and Tigo Energy. 2. Module inverter/micro-inverter: This is also a module-level power converter. It takes DC input from the solar module and converts it into AC electricity, which is then ready to be connected to the load or single-phase main grid or to a central inverter. It is also equipped with MPPT technology to detect the maximum power point of each module. Even though it doesn’t requires any DC cabling, it is more expensive than the power optimizer due to its advanced design. The efficiency of such a power converter is about 96%. The important players in this power converter market are Enecsys and Enphase. As discussed previously, a pn junction diode and a light-generated current are required to model a solar cell. Hence, the simplest solar cell consists of a pn junction diode connected in parallel with the currrent source — shown below in Figure 1. Meanwhile, when there is no light present to generate any current, the PV cell behaves like a simple pn junction diode. However, if the intensity of incident light increases, current is generated by the PV cell. An interactive link is given here http://www.pveducation.org/pvcdrom/solar-cell-operation/iv-curve, where the operation of the PV cell starts from darkened to illuminated condition. Fill Factor: The short-circuit current and the open-circuit voltage are the maximum current and voltage respectively from a solar cell. The “fill factor,” abbreviated as “FF,” is a parameter which, in conjunction with Voc and Isc, determines the maximum power from a solar cell. The FF is defined as the ratio of the maximum power from the solar cell to the product of Voc and Isc. Basically, with higher FF, the performance of a solar cell is better. Characteristic resistance: The characteristic resistance of a solar cell is the output resistance of the solar cell at its maximum power point. If the resistance of the load is equal to the characteristic resistance of the solar cell, then the maximum power is transferred to the load and the solar cell operates at its maximum power point. Parasitic Resistances: Resistive effects in solar cells reduce the efficiency of the solar cell by dissipating power in the resistances. The most common parasitic resistances are series resistance and shunt resistance. In most cases and for typical values of shunt and series resistance, the key impact of parasitic resistance is to reduce the fill factor. Both the magnitude and impact of series and shunt resistance depend on the geometry of the solar cell, at the operating point of the solar cell. Impact of both resistances on the solar cell could seriously reduce the fill factor. For an ideal solar cell, series resistance equals to 0 ohms while shunt resistances equals to infinity. Temperature: Solar cells are sensitive to temperature. Increases in temperature reduce the band gap of a semiconductor, thereby effecting most of the semiconductor material parameters. In a solar cell, the parameter most affected by an increase in temperature is the open-circuit voltage. As the temperature increases, the open-circuit voltage decreases, thereby decreasing the fill factor and finally decreasing the efficiency of a solar cell. It is recommended to operate at 25 degree celsius. The power output for different operating temperatures is shown in Figure 2. Light intensity: Changing the light intensity incident on a solar cell changes all solar cell parameters, including the short-circuit current, the open-circuit voltage, the fill factor, the efficiency and the impact of series and shunt resistances. The light intensity on a solar cell is called the number of suns, where 1 sun corresponds to standard illumination at AM1.5, or 1 kW/m2. Solar cells experience daily variations in light intensity, with the incident power from the sun varying between 0 and 1 kW/m2. At low light levels, the effect of the shunt resistance becomes increasingly important. Consequently, under cloudy conditions, a solar cell with a high shunt resistance retains a greater fraction of its original power than a solar cell with a low shunt resistance. Ideality factors: The ideality factor of a diode is a measure of how close the diode follows the ideal diode equation. The derivation of the simple diode equation uses certain assumptions about the cell. In practice, there are second-order effects so that the diode does not follow the simple diode equation and the ideality factor provides a way of describing them. With such basic ideas, even a customer can determine the performance of a solar cell. In the next part of this series, a converter topology used in the PV system will be briefly describe. Since a solar cell is the only generator in a solar PV system, it is one of the most important parts in a solar PV system. In the following paragraphs, a simple introduction of a solar cell and how it operates is discussed, with reference links for better understanding. A solar cell: A solar cell is a solid-state electrical device (p-n junction) that converts the energy of light directly into electricity (DC) using the photovoltaic effect. The process of conversion first requires a material which absorbs the solar energy (photon), and then raises an electron to a higher energy state, and then the flow of this high-energy electron to an external circuit. Silicon is one such material that uses such process. A solar cell structure is shown in figure 1 and a solar panel configuration in figure 2. 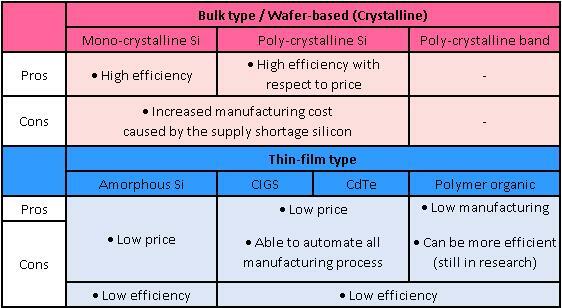 PV cells: PV cells are most commonly made of silicon, and come in two common varieties, crystalline and thin-film cells, as detailed in table 1. A p-n junction: It is formed by joining p-type (high concentration of hole or deficiency of electron) and n-type (high concentration of electron) semiconductor material. Due to this joining, excess electrons from n-type try to diffuse with the holes of p-type whereas excess hole from p-type try to diffuse with the electrons of n-type. Movement of electrons to the p-type side exposes positive ion cores in the n-type side, while movement of holes to the n-type side exposes negative ion cores in the p-type side, resulting in an electron field at the junction and forming the depletion region. An animated visual explanation is shown in this link: http://www.pveducation.org/pvcdrom/pn-junction/formation-pn-junction. A light-generated current: Generation of current in a solar cell, known as the “light-generated current,” involves two important processes. An animated ideal flow at short circuit is shown at this link: http://www.pveducation.org/pvcdrom/solar-cell-operation/light-generated-current. Absorption of incident photons to create electron-hole pairs. Electron-hole pairs will generate in the solar cell provided that the incident photon has an energy greater than that of the band gap. However, electrons (in the p-type material), and holes (in the n-type material) are meta-stable and will only exist, on average, for a length of time equal to the minority carrier lifetime before they recombine. If the carrier recombines, then the light-generated electron-hole pair is lost and no current or power can be generated. Collection of these carriers by the p-n junction prevents this recombination by using a p-n junction to spatially separate the electron and the hole. The carriers are separated by the action of the electric field existing at the p-n junction. If the light-generated minority carrier reaches the p-n junction, it is swept across the junction by the electric field at the junction, where it is now a majority carrier. If the emitter and base of the solar cell are connected together (i.e., if the solar cell is short-circuited), then the light-generated carriers flow through the external circuit. Photovoltaic effect: The collection of light-generated carriers does not by itself give rise to power generation. In order to generate power, a voltage must be generated as well as a current. Voltage is generated in a solar cell by a process known as the “photovoltaic effect.” The collection of light-generated carriers by the p-n junction causes a movement of electrons to the n-type side and holes to the p-type side of the junction. Under short circuit conditions, the carriers exit the device as light-generated current. 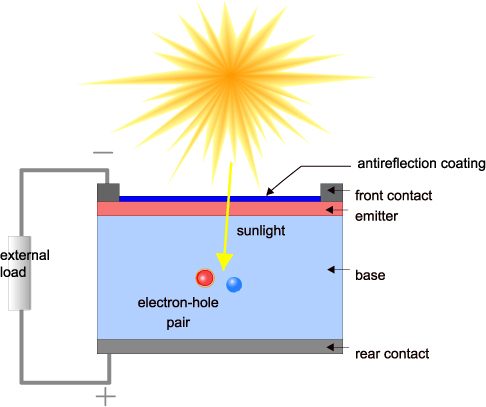 An animated explaination of the photovoltaic effect is shown at this link: http://www.pveducation.org/pvcdrom/solar-cell-operation/photovoltaic-effect. With this basic idea of the operation of a solar cell, a thorough explanation of modeling of a solar cell by using a diode with the diode ideality factor and the operation temperature as well as the parasitic resistance (due to manufacturing defects) will be discussed later. A solar cell: A solar cell is a solid-state electrical device (p-n junction) that converts the energy of light directly into electricity (DC) using the photovoltaic effect. A solar cell is categorized as a multi-junction cell, single-junction cell, crystalline cell, thin-film technology, or some of type of emerging PV cell (like organic cells, etc.). Solar module: Collections of a single solar cell are termed as solar modules. Solar cells are connected by a wire either in parallel or in series according to the desired output. If we wish to have more current, the cells are connected in parallel, and if we wish to have more voltage, the cells are connected in series. Solar module array: When solar modules are connected either in series or in parallel according to the desired output, the collection of the solar module is termed a solar module array. Solar charge controller: If we wish to charge the generated DC power from the solar array to a battery, as mostly seen in rooftop installation, a solar charge controller is inevitable. Through this controller, the battery life is elongated and maintains a constant output voltage for the battery input, which is normally either 12 volt or 24 volt. It uses the PWM (pulse width modulator) or MPPT (maximum power point tracker) technique for better charging performance. Combiner box: The combiner box is an electrical distribution box where the DC circuit breakers are placed. The combiner box combines the multiple DC inputs coming from the panel (either module or array) terminations and converts these into one DC output. The output of the combiner box is connected to the charge controller or the inverter, depending on the type of system installed. 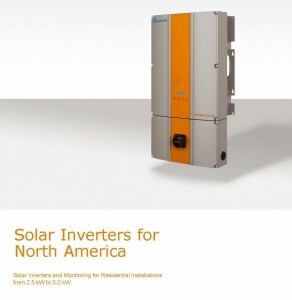 Solar array inverter: This inverter is also termed as a central inverter or string inverter. It converts the single DC output power from the combiner box into AC power which then can be connected to the power/electric grid. This inverter uses the MPPT (maximum power point tracker) technique for better optimized output. However, the problem of partial shading or shadowing — technically termed as potential induced degradation (PID) of the solar panel — is prominent with the use of such an inverter. 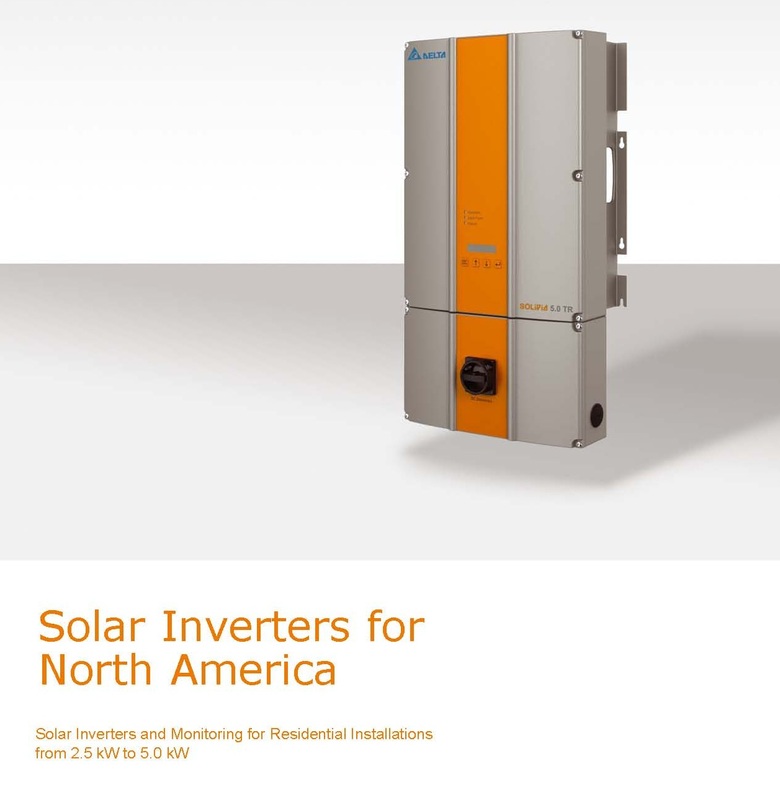 Solar module inverter: This inverter is installed at the modular level. It converts the generated DC power to AC power using a micro inverter for each module. This inverter also uses the MPPT (maximum power point tracker) technique for better output. The advantages of an such inverter are that it has more reliability with better performance. And also it reduces the PID effect. Power cable: There are two types of power cables. Low-voltage power cables (solar panel to the combiner box, combiner box to the inverter, and inverter to the transformer) and medium-voltage power cables (transformer to the substation). Switch gears / protection: Switch gears are one of the most important components in a PV system. It allows protection of the components from any fault during the operation, such as over-current, over-voltage, temperature rises, lightening faults, switching faults, etc. For better reliability of the system, communication between each component is a must. A central monitoring computer allows checking the communication between each component and the execution of tripping the fault. Power quality issues: This has become one of the major topics in the utility sector for common consumers. Due to cabling, there is a higher chance for interference in the power signal, which leads to a reduction in generated output power. For such cases, a metal mesh encasing the cables improves shielding. Due to the use of power electronic switches in inverters, common mode (CM) disturbances are prominent. Because of CM disturbances, transience in the power is seen and the output power is distorted. A thorough understanding of EMC related to the PV system is important for better performance and high reliability for that given PV system. With this basic intro on photovoltaics out of the way, we will next dive into articles more focused on each of these components.